A few years back, when my 8-year-old son was an infant, my husband and I visited the (now-defunct) restaurant Cascadia in Seattle, which focused on regional and seasonal ingredients - hence the name. It was before most of my eco-nuttiness, so I wasn't nearly as in tune to the local ingredients thing, but when we went back the second time - whoa doggie - did I ever grill the waiter. Unfortunately, he didn't have many answers to my litany of questions. But I digress. On that first visit we tried a Douglas Fir Sorbet, mostly because of the uniqueness of it. It was fantastic - one of those flavors that, although you may not want to snack on it daily - has stuck in my mind all these years. And, that's saying something given my ADD. Anyway, last year my husband purchased a little book called Sips & Apps: Classic and Contemporary Recipes for Cocktails and Appetizers, written by a local author, and one of the cocktails included in this fabulous little gem is a Douglas Fir drink that reminded me of that sorbet from yesteryear. So, now that you have that fresh Douglas (or Noble) Fir Christmas tree hanging around the house (and I know that you bought an unsprayed one, didn't you? ), go ahead and clip a six inch section from the tree where no one will notice it missing and make yourself some Douglas Fir infused gin or vodka and get your holiday spirits on! And, don't forget, little sprigs of Douglas Fir also make for a fantastic drink garnish. I think a fir or spruce infused gin, vodka or brandy would also make for a nice present, particularly if you hang a drink recipe around the bottleneck. Fill a cocktail shaker with ice. Measure in the infused gin, cranberry juice and lemon sour mixture. Strain into a martini glass and top with a splash of dry sparkling wine. 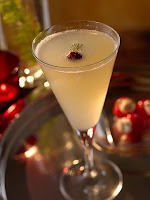 Garnish with a fir sprig and float a cranberry in the drink. Put the fir branch into the gin bottle and cap and let sit for 24 hours (do not leave it in for longer). Remove the branch and discard. The infused gin can be stored at room temperature for up to 1 year. In a small container with a lid, combine the ingredients. Cover and keep refrigerated for up to 2 weeks. Another drink idea is the Pine Needle Daiquiri. If drinking trees ain't your thang, then, by all means go ahead and eat it. 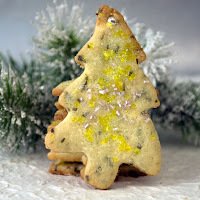 Here's a tasty looking recipe: Douglas Fir & Orange Blossom Butter Cookies. And, for the serious tree snacker, check out this post: Douglas fir tips bring the flavor of the forest into the kitchen. It does have something almost balsamic about it- definitely worth a try. wow, love it that you're crunchy AND a foodie! Sounds interesting, but I'll wait for new growth in the spring. In Canada we call it Buckley's and give it to the kids when they are sick. Ingredients in Buckley's cough syrup include balsam.